Magician displays a bottle of Martini. A drink may be poured out of the bottle if desired. 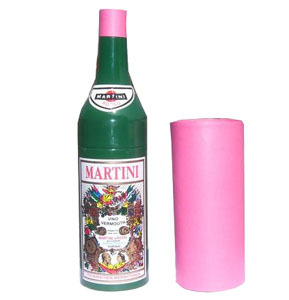 The bottle is covered with a paper Cylinder, only half the height of the bottle. The whole assembly is covered with a large handkerchief, and the magician says he can make the bottle vanish invisibly, under cover of the handkerchief, or visibly, without the handkerchief, — as the audience wishes. Naturally most of the audience will opt for the magician to cause the bottle to vanish visibly, without cover.The handkerchief is placed aside, and the Cylinder slowly squeezed down over the bottle. The bottle seems to get shorter and shorter, till it goes entirely into the Cylinder. Finally the Cylinder is shown right through, and the bottle is seen to have entirely vanished, leaving no trace whatsoever. We supply the item, made in spun Aluminium, complete with Handkerchief, “paper cylinder” and instructions.